We work so hard to bring our pattern collections from swatches and sketches into reality. What makes it really rewarding is seeing what you make from it. One of my favorite parts of this job is checking on Ravelry for finished objects form our patterns. 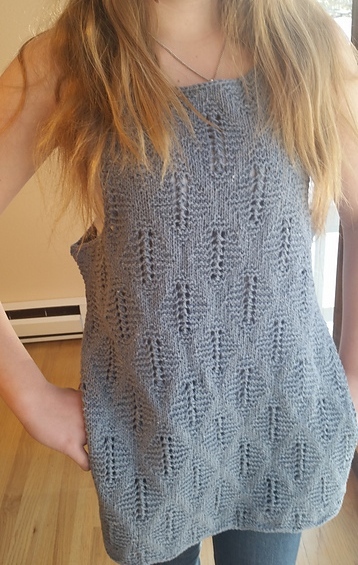 This week, I’m smitten with this version of Sandbells from our spring collection knitted by Diana (mdmkjjm on Ravelry). Sandbells is the tunic dress from the booklet #353 Berroco Indigo, and it’s one of my favorite pieces in the whole Spring/Summer 2015 collection. But it is a lot of style for someone like me who tends to stick with more conservative silhouettes. For her version, Diana shortened the length of the tunic to the hip and raised the armscye (the shape of the armhole) drop just a bit. The shortened tunic feels more accessible to me. I could see wearing this exactly as Diana shows it here or as a beach cover-up on a balmy day this summer. Great job, Diana! Thank you so much for sharing your work with us.